BNL’s Jorie Allen and the No.9 Stars will visit Evansville Mater Dei on Saturday afternoon. Birds are known to fake an injury, to draw a predator’s attention away from a hidden nest. After the shocking loss at Floyd Central, followed by Thursday night’s conquest of North Harrison (which was as impressive as the Floyd loss was stunning), perhaps that’s an accurate description. Time to find out, which BNL team is the one to believe. The Class 4A No.9 Stars (16-5) will look for their first back-to-back wins in a month when they visit Evansville Mater Dei on Saturday afternoon. The Wildcats (10-9) have won two straight following Thursday’s 65-41 victory over Evansville Central, and they’re using this test as a tournament preview. The Wildcats have played too much like the first half of their nickname. They were guilty of 31 turnovers during last year’s loss at BNL, and they had 32 miscues during a 54-32 setback to Evansville Memorial last week. Mater Dei will feature senior forward Jossie Hudson, a University of Evansville recruit who’s averaging 12.8 points and 7.0 rebounds. Senior guard Hannah Winiger contributes 11.0 points. The Wildcats also got a midseason boost when 6-0 sophomore post player Mariah Dickerson returned from an ACL knee injury to play in 7 of the last 8 games. Where does BNL need to be? Focused. That might have been an excuse for the Floyd disaster, and that was certainly an obvious improvement during the dominating triumph over North Harrison. BNL’s defense will be the key to go anyplace. The Stars have surrendered over 40 points only once in the last five games. North Harrison shot only 24 percent. So which BNL team shows up? “I know which one I’m going to vote for,” Allen said. The Stars won last year’s clash with Mater Dei 61-33 as Allen scored 16 points, Jacy Hughes added 11 and McKenzie Messmore added 10. Hudson paced the Wildcats with 14 points. 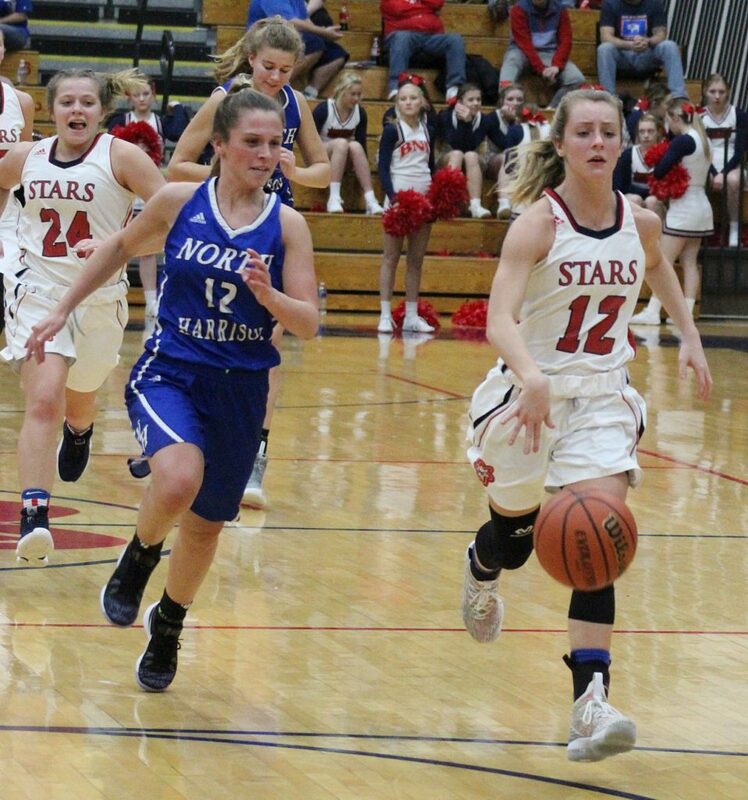 BNL’s Jacy Hughes and the Stars are looking for their first back-to-back wins since Dec. 18. 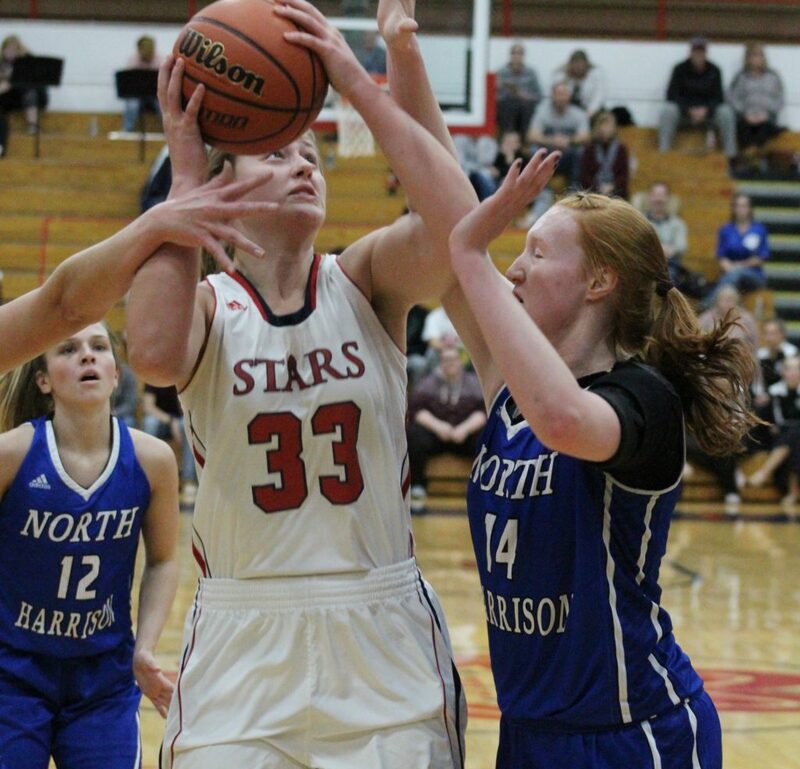 Last meeting: Last year at BNL, the Stars rolled to a 61-33 victory. 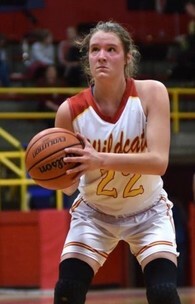 Jorie Allen had 16 points for BNL, and the Wildcats were guilty of 31 turnovers. Jossie Hudson had 14 points for Mater Dei. Game notes: BNL hasn’t won back-to-back games since Dec. 18, when it conquered Bloomington North for its eighth straight victory. The Stars will learn their postseason fate when the IHSAA announces the state tournament pairings on Sunday afternoon. F – Jorie Allen 6-1 Sr.
C – Madison Webb 6-2 Jr.
G – Chloe McKnight 5-8 So. G – Jacy Hughes 5-5 Sr.
G – Gracie Crulo-Rood 5-5 Jr.
F – Jossie Hudson 6-1 Sr.
F – Olivia Effinger 5-9 Sr.
C – Kelsey Carr 5-11 Sr.
G – Hannah Winiger 5-4 Sr.
G – Alaina Spahn 5-5 Sr.